More than 400 students attended the 3rd edition of this initiative that is part of Career Discovery@Técnico programme. Inês D’Ávila, final year student of Integrated MSc in Aerospace Engineering (MEAer), realised the importance of having a business card a few years ago, during the Pitch BootCamp@Técnico. “I had the opportunity to make a curricular internship in a company. When they asked me my personal contacts I tore up a piece of paper, I wrote my phone number and my e-mail, but when I looked to the face of other person I realised how bad that was”, said the final year student of MEAer. “That piece of paper went straight to the dustbin for sure because it has shown a lack of maturity”, she adds. She went home and tried to design a business card but “it didn’t work”, she shares. Aware of the importance of this “little card that introduces us in the labour market”, she was looking to have Técnico Business Card. 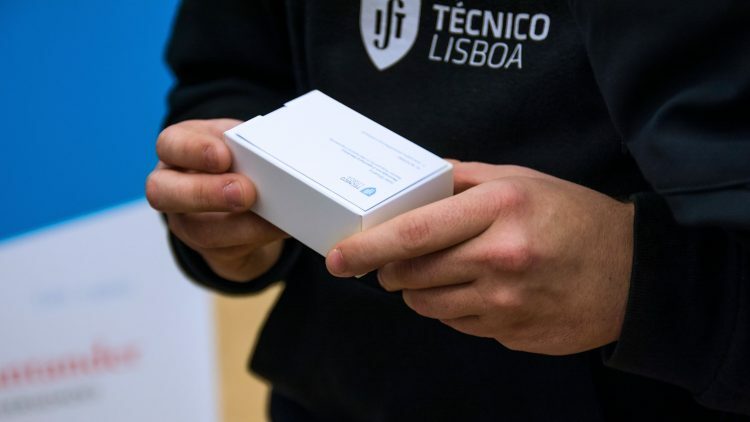 This Wednesday, October 23, Inês was one of the 424 final year students who took home the little blue card designed by Técnico. The activity that is part of Career Discovery@Técnico is already in its 3rd edition and students’ interest tends to increase. Carolina Fernandes, student of Information Systems and Computer Engineering, heard about this activity by friends and applied for a Técnico Business Card. She smiled as she opened the box. “The card design has everything to do with Técnico”, she says. Although she has a job before finishing her course she reaffirmed that the card will be very useful. “Besides being an important tool in managing your professional life, it is also something that will remind us of Técnico”, says Carolina. One by one, the final year students, were receiving personalised business cards that included the name, email, telephone number and “the name of the university where we graduated and that makes a difference. Getting a degree from Técnico always makes the difference”, points out Inês d’Ávila. “I love the back side of the card. The mathematical formulae give the card a very modern look and represents very well the mathematical contents that we learn here”, comments the final year student. 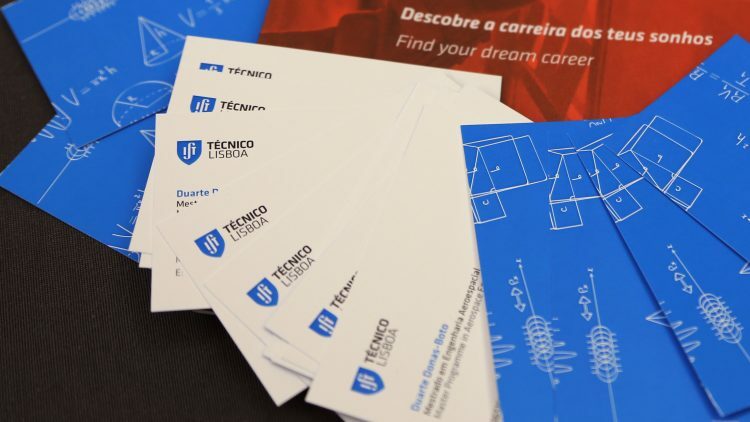 From 1st to 3rd edition the number of students interested in Técnico Business Cards has quadrupled. 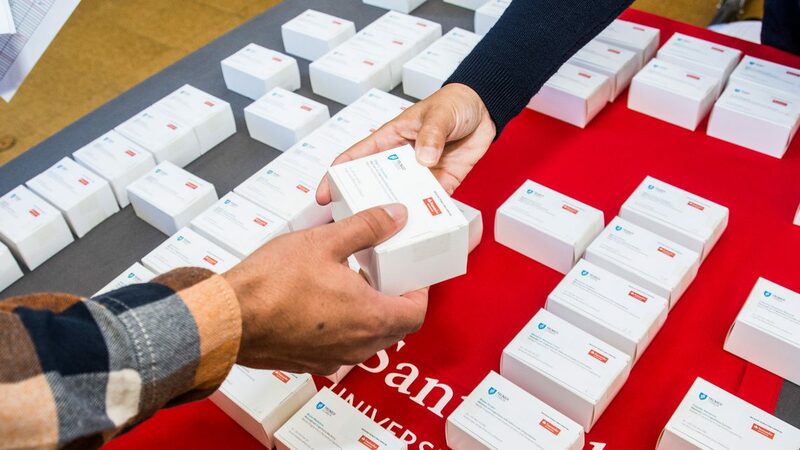 This initiative is organised in partnership with Banco Santander Totta and more than 754 final year students have already applied for Técnico Business Cards.